My son’s U11 team is notorious for its inconsistencies, not just from game-to-game but from half-to-half. Granted they are mostly 10-year-olds and this pattern is by no means unusual. Tired of this inconsistent play and losses against much weaker teams, the team dad, Gene, decided to take an unusual approach to solving this problem. Before each game or after a poorly played half, he would ‘de-curse’ the boys’ shoes. The boys collectively stick out their shoes. Gene visits each player and performs an elaborate exorcism by ‘ptooing’ and then commanding the demons or ills that are possessing the boys’ shoes to disappear (see photo below). Just recently, the goalie started asking that his gloves be de-cursed as well. Since this ritual began, the team has not lost a game and they will be playing in the NorCal State Cup finals at the end of December. 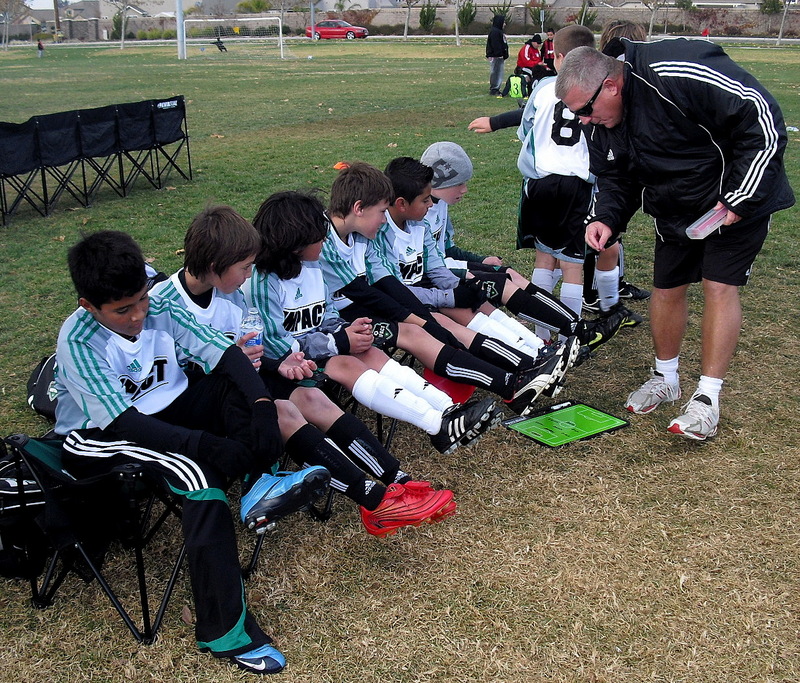 I think de-cursing the shoes is a very clever and age-appropriate solution to a problem that many coaches face. It is fun to see the kick, joy, and amusement the boys get out of this ritual. At this age and this point in the season does it matter if they believe that the ‘de-cursing’ is the cause for their improved player rather than the culmination of all the hard work they put in this year? I don’t think so. Also what I’m almost 100% sure of is that six years from now when the boys are reminiscing about their youth playing days, they will have no idea if they won this year’s NorCal tournament but they will definitely remember the ‘de-cursing’ ritual. Soccer is not just about playing the game, learning technical fundamentals, socializing, understanding the concept of ‘team’, and good sportsmanship. It is also about creating lasting memories that 10-year-olds find important and enjoy. If you have a similar story, I know the readers of ‘Improving Soccer in the United States’ would love to hear it.